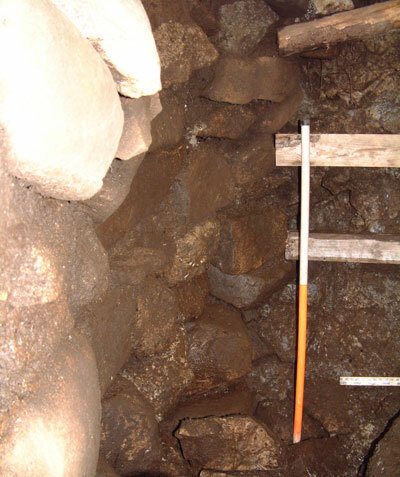 The excavation of the man-made stairwell leading down into Bone Passage continues, removing the sediment and boulder fill that was used to block the passage during the Iron Age. Between the 23rd and 24th March we excavated approximately 0.6 metres of fill from the blocked passage, which comprises medium to large granite and limestone boulders, and pockets of organic-rich sediments. We are wet-sieving the sediment from the passage and have retrieved charcoal fragments, charred cereal grains and seeds, and fragments of burnt and unburnt bone. Several fragments of human bone have also been recovered, some of which is most likely associated with the burial of the woman excavated at the end of fieldwork last year. However, there are also skeletal elements relating to the infant and human foetus, mixed with bone from a foetal pig. Within another part of the fill of the passage excavated last week we also recovered three well preserved pig bones, which were lying together between a large granite boulder and the natural limestone bedrock that forms the back wall of the entrance passage. These bones all appear to belong to one full leg of a pig and may have been placed in the fill as a votive deposit. A total of six steps had been uncovered in the passage by the end of work on the 24th March. The steps are quite poorly built, comprising just enough room to get your heel on the tread - some of which are sloping at alarming angles. This may be due to subsidence in the archaeological deposits, into which the structure has been built. Some of the steps have been built into the side retaining walls, while others appear to lie within the void of the passage. Small under-pinning stones had originally been used to level the steps and stop them from rotating forward.Overlying the steps is a thin layer of in-situ archaeological deposits, from which we have recovered several sherds of prehistoric pottery and larger lumps of charcoal. As we removed the fill from the passage more voids started to appear, some of these being quite large allowing us to peer down towards Bone Passage below. With a visual connection between the base of the excavations in the stairwell and the cave below being a possibility, Martin entered the cave and proceeded to the end of Bone Passage. We could clearly hear each other through the remaining fill and Martin thought he could see light coming down from above. He directed his caving lamp up through one of the voids and I could see this clearly some 1.2 to 1.4 metres below - our first visual connection! 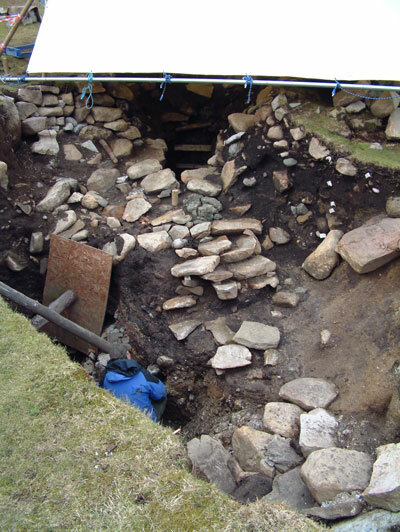 From our excavations so far it would appear that the entrance passage is intact, although the people who built this structure during the Iron Age had poor quality stone to work with. We estimate that we have around 2.2 metres of fill to take out of the passage before we reach the level of the archaeological deposits (floor) in Bone Passage, and a further 0.8 to 1.0 metres of deposit to take out of Bone Passage before we reach the natural limestone floor of the cave. Therefore, we still have some way to go and the entrance passage is becoming wider with depth. 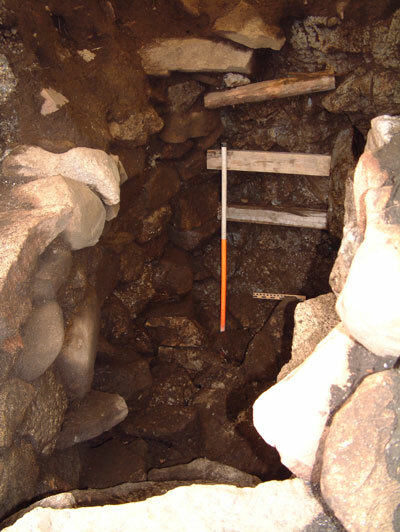 When the excavation is complete, we should have a very interesting structure to record. 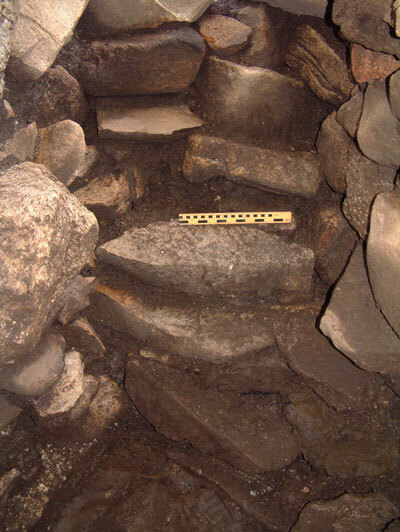 The built structure may be in excess of 2.5 to 3.0 metres in height, resembling a staircase within the intra-mural galleries of a broch wall. Visit the website again soon to catch up on the latest news regarding the excavation of this enigmatic Iron Age structure. Glad that you have made such great progress this past week despite the weather. The resemblance of structure to brochs is very interesting; it links in well with the time of the brochs being built. I wonder if the people who lived there had any connection to the nearest broch where they may be learned their construction techniques. Carry on with your good work - it is of great interest to Joan and I.